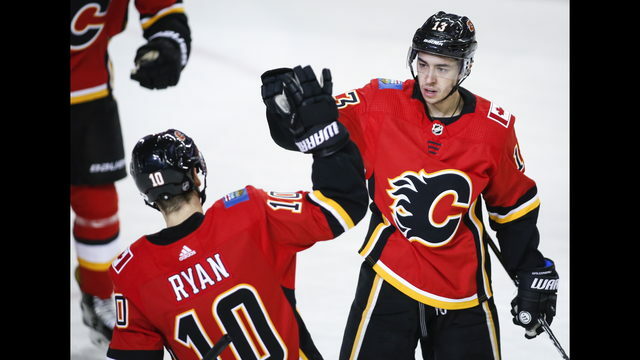 CALGARY, Alberta (AP) – Johnny Gaudreau scored his team-leading 35th goal and Michael Frolik added a goal and an assist and the Calgary Flames earned a 4-2 win over the Columbus Blue Jackets on Tuesday night. Mangiapane scored late in the first period and Frolik 35 seconds into the second for an early 3-1 cushion. Columbus shooters rang the puck off Calgary’s post three times during the first 40 minutes. Bjorkstrand’s power-play goal at 5:28 of the third period pulled the Jackets within a goal. His wrist shot from the faceoff circle rolled up and over the left shoulder of Rittich. Frolik scored Calgary’s third goal on a neutral zone pass from defenseman T.J. Brodie. Frolik eluded Blue Jackets defenseman Seth Jones to beat Bobrovsky. Blue Jackets Lukas Sedlak and Ryan Dzingel both shot the puck off Rittich’s left post during the last three minutes of the first period. Werenski made the most of a neutral zone turnover by Calgary for the game’s first goal. The defenseman hustled the puck into the offensive zone and beat Rittich with a wrist shot at 10:25. NOTES: Flames center Sean Monahan (illness) and winger Sam Bennett (upper body) were scratched a second straight game. … Giordano tied Robyn Regehr for the second-most games played by a Calgary Flame with his 826th. … With an assist, Giordano has five in his past five games. Blue Jackets: Visits Edmonton on Thursday night. Flames: Hosts Ottawa on Thursday night.